High-strength lithium disilicate press ceramics. Strong system – aesthetic result. *Vita Classical® and Vita 3D-Master® are registered trademarks of VITA Zahnfabrik. Investment for pressing – smoother than ever. Low-reacting, high-strength lithium disilicate ceramic with high level of bending strength 450 MPa (3-point bending test). With ceraMotion® LiSi, all colors match the shade guide required. In addition to the most important Vita Classical®* tooth shades, the product range includes eleven of the most popular Vita 3D-Master® colors – a first for a press ceramic. Shades that are in less demand are finished using ceraMotion® One Touch products. 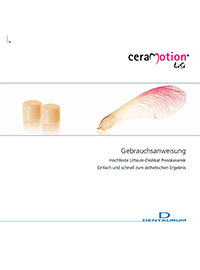 ceraMotion® LiSi is perfectly coordinated to have the translucency needed to reproduce the natural tooth. Aesthetic results with one firing. No compromises for monolithic crowns. Making good use of synergies. Both ceraMotion® One Touch and ceraMotion® Zr veneering ceramics harmonize perfectly with lithium disilicate and zirconium oxide. Important Dentaurum products can be combined with one another very efficiently. A whole range of aesthetic, all-ceramic materials is available with the large selection of Nacera® zirconium oxide blanks and ceraMotion® LiSi press ceramics. Development and production of logically coordinated systems. "We want to leave a company behind for our children and future generations that is economically strong and working within an intact environment."